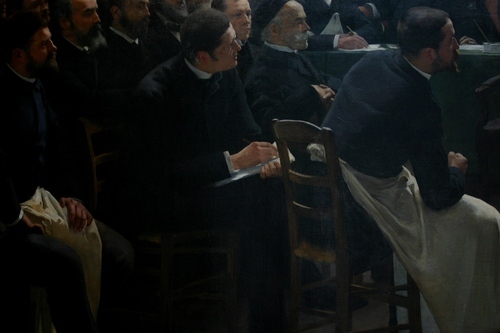 This big oil painting by the French artist Pierre-André Brouillet1. is one of the most known in the history of medicine. 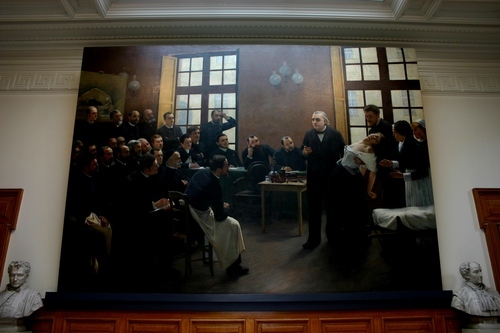 It represents Jean-Martin Charcot demonstrating in a clinical lecture to his colleagues at the Hôpital de la Salpêtrière that the symptoms of hysteria were as real as those of any organic disease. The patient is the famous hysterical "Blanche" (Marie) Wittman, who is supported by Joseph Babiński, while supervising nurse Marguerite Bottard (next to Babinski) and the younger nurse Mademoiselle Ecary assist2. Many others famous neurologist and scientists can be recognized in the audience. 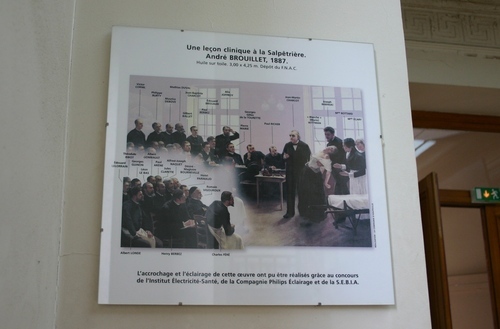 Among them:Désiré-Magloire Bourneville, Georges Gilles de la Tourette, Pierre Marie and Paul Richer (see the explanatory table in Picture N°3). 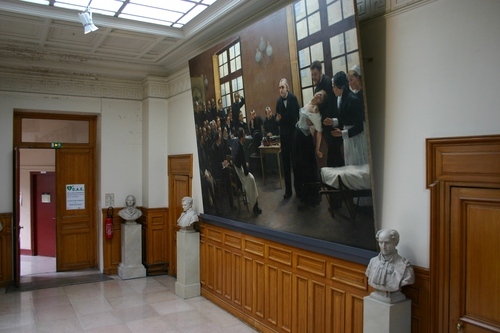 The painting can be seen in a corridor of the Université Paris Descartes in Paris, near the entrance staircase to the Musée d'Histoire de la Médecine. 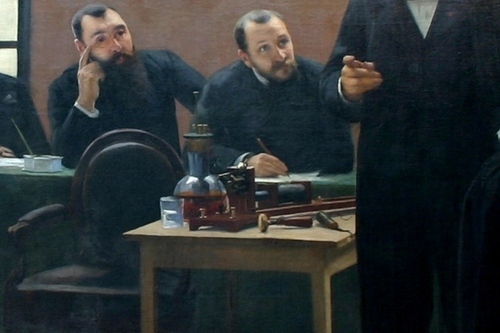 On the table next to Charchot there are inductors connected to a Grenet battery for electrotherapy, of the same type as the ones you can see in the near Musée d'Histoire de la Médecine. Photos by Luca Borghi ti.supmacinu|ihgrob.l#| (July 2014), courtesy of the Museum's direction. 1. Cf Georges Guillain, J.M.Charcot 1825-1893 (Sa vie, son oeuvre), Masson, Paris 1955, p.21. 2. 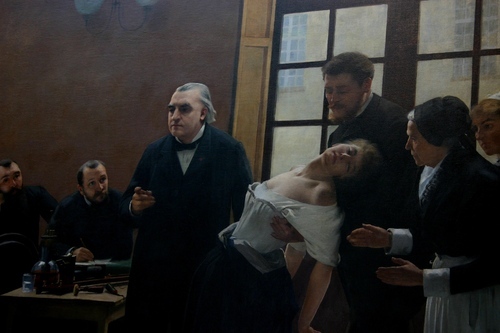 Nadine Simon-Dhouailly, La leçon de Charcot. Voyage dans une toile, Musée de l'Assistance Publique, Paris 1986, pp. 67-68.